Need kitchen countertop ideas? Carolina Countertops can help you transform your kitchen, baths or other areas easily and quickly with a wide variety of natural stones and quartz. 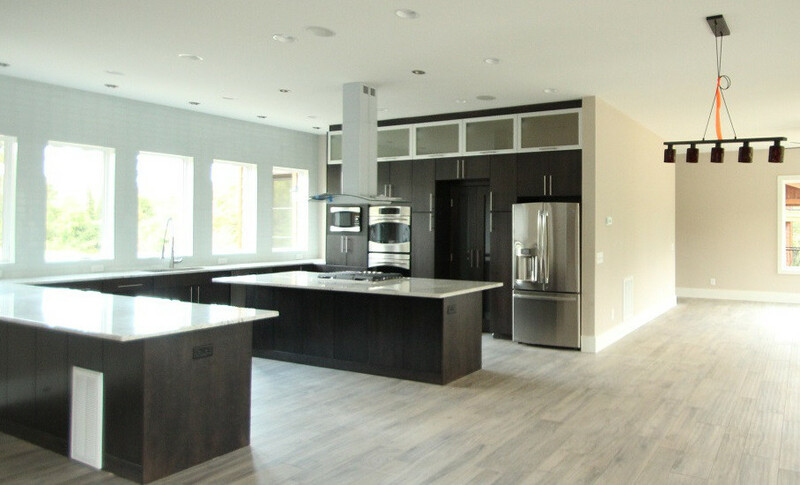 Homeowners can choose the perfect color and style of material which will complement the overall decorative style and the color palette of the kitchen, bath or other area. Because of the diversity of materials, textures, colors, edging, and ways to fabricate these materials, we can help you make a statement or simply add timeless beauty to your kitchen or space. 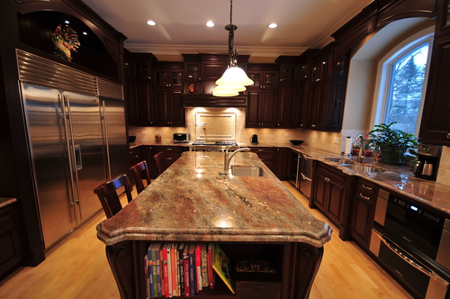 Granite, marble and quartz are available in a variety of styles and colors. Natural stones offer their own unique look with their natural beauty. Although some styles of granite and marble and very uniform, some offer movement, veining, and character that are simply a piece of art! Whether you are want modern but simple or you are looking to make a unique, one of a kind statement, Carolina Countertops offers many kitchen countertop ideas to help you can achieve just what you desire. One way to add a unique look is to combine two different materials in one space. You can use two different surfaces to give dimension and color to space or to your cabinets. Often people will use one material for an island another for the rest of their countertop area. This is a way to showcase a special stone or simply to add style and beauty to your room. 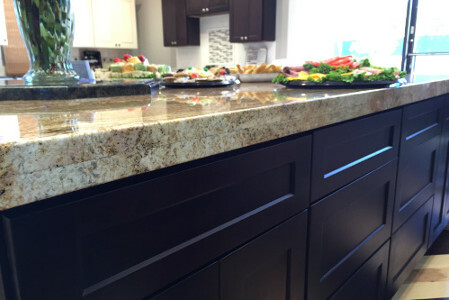 Again the materials come in all colors, textures and patterns, so you can create any of your kitchen countertop ideas. Typically solid surfaces are flat and polished, however some materials are available in honed or leather which has a more textured feel and look. There are also many different types of edges you can select from to help complete your design. You can choose from modern strait edge to various beveled edges for traditional to more elaborate appearances. The laminate edge which has and extra thick appearance, has become very popular as well in many home improvement shows. Full backsplashes which cover the entire wall and “waterfall” islands which cover the sides to the floor are also becoming increasingly popular. Homeowners are also using these materials for much more than just kitchens and bath vanities these days. Natural stone is used for shower/bath walls, fireplaces, shelves, benches, table tops and outdoor spaces. Explore kitchen countertop ideas for your next project with Carolina Countertops and our expert staff will help you make your dreams come true. Please call for a consultation. © 2015 Carolina Countertops. All rights reserved.